In mathematics, a series is the cumulative sum of a given sequence of terms. Typically, these terms are real or complex numbers, but much more generality is possible. The above writing stresses the 'cumulative' nature of the series and is justified by the mathematical definition we introduce below, but more direct notation is typically used: 1 + 2 + 3 + ... . Depending on the number of terms, the series may be finite or infinite. The former is relatively easy to deal with. The finite series is identified with the sum of all terms and — apart from the elementary algebra — there is no particular theory that applies. It turns out, however, that much care is required when manipulating infinite series. For example, some simple operations borrowed from the elementary algebra — such as a change of order of the terms — often lead to unexpected results. So it is sometimes tacitly understood, especially in analysis, that the term "series" refers to the infinite series. In what follows we adopt this convention and concentrate on the theory of the infinite case. Fig. 1. Graphical representation of a geometric series. Given a series, an obvious question arises. Does it make sense to talk about the sum of all terms? That is not always the case. Consider a simple example when the general term is constant and equal to 1, say. That is, the series reads as 1+1+1+1+... (without end). Clearly, the sum of all terms can not be finite. In mathematical language, the series diverges to infinity. There is not much to say about such an object. If we want to build an interesting theory, that is to have some examples, operations and theorems, we need to deal with convergent series, that is series for which the sum of all terms is well-defined. This is a special example of what is called geometric series. The sum is finite! 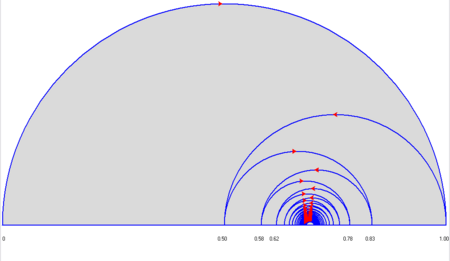 Instead of a rigorous proof, we present a picture (see fig.1) which gives a geometric interpretation. Each term is represented by a rectangle of the corresponding area. 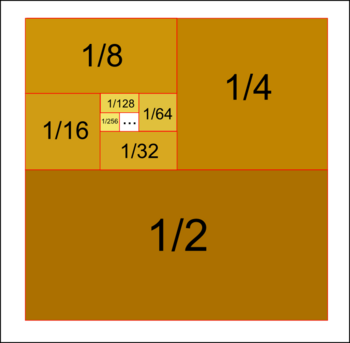 At any moment (given any number of rectangular "chips on the table"), the next rectangle covers exactly one half of the remaining space. Thus, the chips will never cover more than the unit square. In other words, the sum increases when more terms are added, but it does not go to the infinity, it never exceeds 1. The series converges. Obviously, the original sum is at least as big as this and our claim follows: the sum of each group is at least one half. And since there are infinitely many of such groups, the sum of all terms is not finite. These examples show that we need criteria to decide whether a given series is convergent. Before such tools can be developed we need some mathematical notation. Then, the series is defined as the sequence and denoted by  For a single n, the sum is called the partial sum of the series. Note that the sum (i.e. the numeric value of the above limit) and the series (i.e. the sequence ) are usually denoted by the same symbol. If the above limit does not exist - or is infinite - the series is said to be divergent. The simplest to investigate are the series with positive terms In this case, the cumulative sum can only increase. The only question is whether the growth has a limit. This simplifies the analysis and results in a number of basic criteria. Notice that it is not positivity that really matters. If a given series has only negative terms, a "symmetric" argument can always be applied. So the only thing we really need is the constant sign. However, for the sake of clarity, in this section we assume that the terms are simply positive. There is a "family" of relative tests. The nature of a given series is inferred from what we know about another series, possibly simpler one. If for two series and we have and if the series is known to be convergent, then the other one, is convergent as well. In other words a series "smaller" than a convergent one is always convergent. This is not difficult to justify. When we consider series of positive terms, the cumulative sum may only increase. For convergent series the growth is not unlimited -- there is an upper bound. Accordingly, the growth of the "smaller" series is limited by the same bound. The above argument works the other way round too. If for the two series we have and the series is known to be divergent, then the other one, diverges as well. In other words a series "bigger" than a divergent one is divergent too. with a finite strictly positive constant , then both series are of the same nature. In other words, if one series is known to converge, the other converges as well; if one diverges, so does the other. There are also tests that allow to determine the nature of a given single series. Two most popular are listed below. If L is strictly greater than 1, then the series diverges. If L < 1 then the series is convergent. The case L = 1 gives no answer. Indeed, take for example . A short computation gives L = 1. Notice that we showed that this series is divergent. On the other hand, if , the series was shown to converge. Still, if we compute L from the above formula, we get L = 1. ( here refers to the upper limit of the sequence). Similarly as before, L > 1 implies divergence, L < 1 means that the series is convergent. The case L= 1 does not allow to decide. Which one of the two above tests is more appropriate depends on the form of the general term. However, not only computational convenience is in question. In some cases only the root test can be applied. Consider for example the series 1 + 1 + 1/2 + 1/2 + 1/4 + 1/4 + 1/8 + 1/8 + 1/16 + 1/16 +.... Formally, the limit of the ratio does not exist (the upper limit is equal to 1, the lower limit is 1/2). Nonetheless the root test gives and this determines that the series converges. In general, the root test is more universal in the following sense: if the limit L of the ratios exists, then the limit of roots exists as well and both are equal. On the other hand, if the ratio test fails to give an answer due to L = 1, then there is no hope that the root test allows to decide. Fig. 2 Alternating series converges if the "steps" are shortening. Even a more general result can be shown: for any given number we can find a rearrangement of terms in our series to get the total sum of M.
To assure a more regular behaviour the notion of absolute convergence is introduced. We say that a series is absolutely convergent if the series converges. The absolute convergence is stronger that the simple convergence introduced at the beginning. This means that any absolutely convergent series is convergent in the former sense. Consequently, given a series with arbitrary terms one may apply any of the above mentioned basic criteria to . If the result is positive ("convergence" detected) it means that the series is absolutely convergent -- so it converges in the sense of the first definition as well. Furthermore, the absolutely convergent series do not change the sum on reordering terms. However, as we showed there are interesting series that are convergent but not absolutely convergent. Typical examples include alternating series, that is series whose general term each time changes the sign: For these we have a criterion. If form a decreasing sequence and the sign of is alternating then the series is convergent. With this useful tool we immediately see that our alternating harmonic series converges. This is not very surprising -- since an actual proof of the criterion is just mathematicaly rigorous transcription of what can be seen on the Fig.2. The general terms are obviously equivalent (the ratio converges to 1). The first series converges in virtue of our last criterion while the second one may be shown to diverge. We can invert the question we dealt with so far ("what can guarantee the convegence") and ask what follows from the convergence of a series. What all convergent series have in common? Here is an answer. On one hand, the sum of a series of functions is defined in the same way as above, — as the limit of the sequence of functions , the partial sums of the series. On the other hand, convergence of functions differs strikingly from convergence of numbers. There is only one widely used convergence mode for numbers; in contrast, there are several widely used convergence modes for functions. It is convenient to reduce the general convergence, , to the special case, , letting . converges to 0 pointwise but not uniformly. It means that, given and , there exists such that for all . However, depends on , and no can serve all . In other words: converges to 0 for every x (which means, x not depending on n), but need not converge to 0 for arbitrary sequences . For instance, leads to . Every example of the sequence of functions is relevant to the general theory of functional series, since it corresponds to some example of the series of functions , namely, . for 0 ≤ x ≤ 1. Most important are two classes of series of functions: power (especially, Taylor) series whose terms are power functions and trigonometric (especially, Fourier) series whose terms are trigonometric functions ; the latter being the real part of the complex number for , the series with terms is also treated as Fourier series. These two classes are unrelated when is real, but related via complex numbers: if then . Taylor and Fourier series behave quite differently. A Taylor series converges uniformly, together with all derivatives, on whenever a is less than the radius of convergence, and its sum is a smooth (more exactly, analytic, therefore, continuous and infinitely differentiable) function. The behavior of a Fourier series depends on the behavior of its sum. If the sum is smooth enough, the series converges uniformly, together with some derivatives. If the sum is only continuous, the series need not converge uniformly, nor even pointwise. If the sum is square integrable (maybe quite discontinuous), the series converges in the sense that . Some distributions (generalized functions) also may be developed into Fourier series, in which case convergence is much weaker. The different behavior of power and trigonometric series corresponds on the complex plane to the different behavior of a function, analytic on a disk, inside the disk and on its boundary. Inside the disk the function is always smooth; on the boundary it can be quite a bad function, and even something more general than a function. ↑ A simple calculation shows that the sum is actually equal to one. More details in geometric series article. ↑ This is called Riemann series theorem. ↑ To verify this one may consider the difference of the two general terms. This page was last modified 07:33, 13 January 2010.